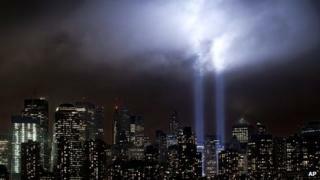 It's a decade since 9/11 happened but it is still not old news - and nor should it be, says Simon Schama. I'm in the memory business. Historians have to be. It's no good pontificating about the meaning of wars and revolutions and slumps and booms that happened long ago, or just the other decade, unless you have a weirdly personal illusion of having been there yourself. Without that spooky wiring of walking through time you're just another peddler of opinion. And we don't need any more of them do we? So yes, thanks to my over-active gambolling hippocampus - the seahorse in the brain - I can tell you precisely what the weather was like when the Bastille came down in July 1789 - sultry. And what it was like when Parisians celebrated the fall of the fortress a year later - raining. I may not have a clue on any given Wednesday where my car keys are, but I know all about the strangeness of Winston Churchill's underwear - write to me - and what Pope Leo did to stop Charlemagne from crowning himself as Holy Roman Emperor on Christmas Day 800. Write to me again. So on the 10th anniversary of 9/11 this last September I remembered, with painful acuteness, not just that cruelly clear Tuesday blue sky through which planes turned into missiles and shot into the heart of free cities, but also sensations I didn't want to recapture. Back they came all the same. The odour of the acrid stench that hung in a sallow bloom over the skies of Manhattan for weeks afterwards. Smell being the most developed organ of memory, I can make myself inhale it all over again. I can taste the poison ash, particulated so microscopically you couldn't see it, that coated my tongue. At the bidding of memory I can sense the weight of crud stuck in my gullet, the puffy smoke deposited on the membrane of my lungs. There were places in New York it hurt to breathe. I remember pedestrians doing what they never usually do in New York - slowing down on the sidewalks, treading gingerly at the corners. I remember downtown shop windows and lamp posts quilted with photocopied faces of the missing, the tear-off strips of telephone numbers imploring a phone call. I remember how the autumn winds blowing through the streets had ripped many of them from their moorings, so they blew along the pavement and into the gutter like dead leaves. The faces, snapped by their friends and families, lovers and office mates, were all smiling. Well they would be wouldn't they? Cheeeese! So it was on those smiling faces that we cheesily trod on the way to work, to a movie, to a meal, to the rest of our lives. Once the gates of memory open you can't stop their onrush, can't put on the brakes. They pull you along hippocampus-driven. So the 10th anniversary of 9/11 caught me thinking about our home-grown calamity, 7/7, as well. The crowds trudging home over London bridges in woeful shock, not even having to try to be British - the ancient instinct of the shy who don't need to be told when to be kind to strangers. You'll say - and I can understand it, believe me I can - isn't this enough now? Enough with the picking over the scabs. Enough with the self-righteousness against fanatically deluded monster martyrs. Enough of the atrocious wars waged in the name of doing them in, which only succeeded in adding another 100,000 more deaths to the original 3,000. And in the name of what, do pray tell us? Don't I understand it's over. Osama Bin Laden is over. Anwar al-Awlaki is over. Khalid Sheikh Mohammed is in the slammer but so over. The whole lunatic racket al-Qaeda is over. So forget the remembering for a bit. Haven't we got enough worries and miseries to haunt our nights and stalk our streets? Our jobs. Our worthless mortgages, our rowdy schools, our understaffed overstretched hospitals? So give it a rest. Won't you, you say, try a little oblivion. It's the New Year, just move on. I wish but I can't. Or maybe I don't want to. You're telling me that 10 years is an aeon in tweet time, that it's all so long ago. Not just history, but ancient history. What counts now is not suicide terrorism but much more compellingly and urgently, the fate of the Arab Spring. But last September and ever since it feels that 9/11 isn't old news at all. It bleeds - in every sense - into today's front pages, into next year's and the foreseeable future's anxieties, for three reasons. Historians always give you three reasons for anything don't they? Why should I be any different. So first off, 9/11 wasn't just an impersonal historical moment. Not just the day when American cities joined the global club of bombed cities, not a few of them torn to shreds by American weapons. No, for me 9/11 resists the balm of forgetfulness because it was personal, because along with countless thousands I lost someone to the inferno. She was the sister of one of our closest friends when we were living in Boston, often there in that warm chattering kitchen where we rounded up our kids. She worked in New York theatre, acting and sometimes managing at others. But the stage life won't pay the rent so she gave motivational seminars to business executives in the World Trade Center once a month. She was 40, pretty, zaftig soft and curvy, expansively warm-hearted. I remember her on winter nights, arms full of small children including our own, feeding cookies into their crumby little mouths and crooning show tunes as she stirred a pot in the kitchen. You might suppose her bereft sister would have been consumed by vengeful bitterness at the loss, but inconsolable sorrow turned instead to a battle for understanding. A struggle for empathy with others - in Baghdad for instance - who, all innocent, were subjected to their own plague of bombs and carnage. An organisation, Families for a Better Tomorrow, arose from the ashes of grief. Other women I know - and it is striking how often these are the stories of women - have shown heroic resilience in their determination to do something other than lament. At our local coffee shop I got to know the widow of a fireman lost in the choking smoke. Breezy, flashing eyes, Italian-American, but she was left with a large family to succour. But rather than just struggle to endure, she turned self-educated documentary film producer and ended up making From the Ground Up, a fine film that told the stories of similarly bereft wives of firemen. It was strong enough to get screened at the Sundance Film Festival and on American public television. These two women responded quite differently to the 10th anniversary. The fireman's wife took her children to the simple, tragically beautiful memorial cascade at Ground Zero to commune with her husband's memory. The sister in Boston would have nothing to do with it, aggrieved that somehow 9/11 commemorations had become a platform for the expression of shallow patriotic bombast. But for both of them, as for me, standing at a little distance, forgetfulness is not an option. And the second reason why the awful business seems not yet over? I'm what the fancy magazines call NY-LON - half of me New Yorker, half of me Londoner. I grew up in one city, I work in the other. For me the Atlantic is just a five-hour ditch separating two homes about which I feel equally passionate. The attacks I believe were as much assaults on what they share, the idea of the secular, cosmopolitan, free and tolerant city, as they were on the citadels of American monied and military power. One area of collateral damage from those attacks has been our own capacity to sustain cultural tolerance. Take for example an Islamic Cultural Centre to be sited not far from the World Trade Center. It was routinely attacked as the Mosque at Ground Zero, though it was neither a mosque nor at Ground Zero. And though the project was eloquently championed by the Jewish mayor of New York, it ended up being demonised as a victory for the jihadis rather than their defeat by the virtues of pluralism. The third reason why it's not all over yet, and maybe most important for the coming year - American troops may be out of Iraq and Osama Bin Laden may be dead, but his restive ghost may not be altogether displeased with what has unfolded. Two unfunded wars together with a Pollyanna philosophy of tax cutting have created a fiscal catastrophe in the United States. Skyscrapers might be rising again on Wall Street, but the bonanza capitalism they once housed will never be the same. Theocratic despotism Taliban style, with its war on the education of women, is undefeated in Afghanistan. Al-Shabab wages a war of savage coercion in Somalia. The Iranian theocrats make a joke of democracy, while allegedly falsifying election results and rule through the thuggish intimidation of militias and the torture of Evin prisoners. It's commonplace to assume now that the overthrow of dictators in the Arab world is most likely to generate victories for Islamist parties, as it already has in Tunisia and Egypt. The issue that hangs in the balance is whether those Islamist governments will lean towards the Turkish or the Iranian model. Can Islamists co-habit with the unfaithful or are they ultimately committed, as the Salafists in Egypt candidly admit, to the rule of God rather than the rule of the people? In the profoundest way of course, the popular risings of the Arab Spring do turn the page from the blood-soaked chronicle of suicidal terror. They represent acts of faith in the recreation of political community in the Arab world, not prostration before perverted dogma. The cult of martyrdom raises death over life, Tahrir Square sanctifies the opposite. But whether the revolutions replace the jihad or enable it will be next year's question. Will the authoritarianism of the military oligarchy merely yield to the theocracy of the intolerant? The contest for revolutionary succession will be between the apostles of obedience, submission and doctrine, who want a state of armoured piety in which there is room only for Muslims, and those still a minority, who value persuasion over coercion, freedom of expression over enforced orthodoxy, educational and professional opportunities for women over their subordination to men. This contest, it can't be emphasised too much, is not an argument between the secular and the religious life, but between those who see the state as the enforcer of obedience and those who see it as the protector of dissent. Between those who would criminalise sin and those who would put private transgression beyond the power of public law. Between the militantly intolerant and the militantly tolerant. This is not just a battle fought out within Islam. Israeli Jews are equally caught up in their own cultural civil war involving the ultra-orthodox, who cherish the idea of a state ruled by the religious prescriptions of the Torah and the Talmud, rather than by civil law and civil rights. And in the run-up to the American presidential election, bidding up your rivals in professions of Christian sanctimoniousness is a must for those seeking the Republican nomination. Rewriting history, they claim that the Founding Fathers intended the United States to be a Christian commonwealth. But one of those patriarchs at least could not have disagreed more. The one who wrote the Declaration of Independence and insisted that Jesus was not in fact the Son of God, but just a noble moral teacher. The one called Thomas Jefferson. Of course with this record of principled scepticism - his contempt for the doctrinaire - Jefferson would not, as it were, have a prayer of winning the Republican nomination. But all the same, it's his words which remain more powerful than all the heavy weapons we can muster to throw against the forces of intolerance and fanaticism. "The legitimate powers of government extend only to acts that are injurious to others," he wrote. "But it does no harm to me for my neighbour to say there are 20 gods or no god. It neither picks my pocket nor breaks my leg. Truth is great and will prevail if left to herself." Amen, I say, to that.